N.H. National Guardsmen Return Home After "Operation Spartan Shield"
About 120 members of the New Hampshire National Guard returned home Friday after serving in the Middle East in support of "Operation Spartan Shield." The Army National Guardsmen from 3rd Battalion, 197th Field Artillery Regiment returned after being gone for more than 11 months. Specialist David Dela Cruz said he was happy to be home with his family and his little boy. "Very excited to be with my little man," Dela Cruz said. "The first time I saw him was when he was born ... very happy that this day has finally come, so I thank everybody that I was with, and I'm happy that I'll be home with my family." Sgt. 1st Class Randay Carver, who has been away for more than nine months, said his wife and children have no idea he is home, and he can't wait to surprise them and see their reaction. 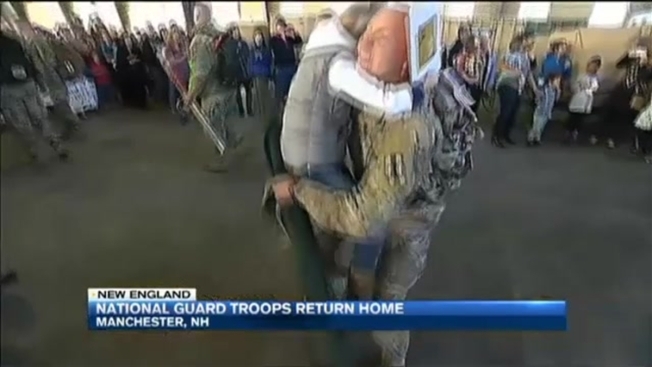 National Guard Members Welcomed Home in N.H.
"Tears, tears of joy, tears of happiness, I know that's how I'm going to be," Carver said. "I'm pretty sure my wife and kids are going to be the same." Like so many at the Manchester Armory on New Year's Day, Carver's father, Karl Patnode, said he is very proud and just relieved to have his son home safe and sound. "This build-up and surprise of having Randay home is all worth it," Patnode said. "So it's exciting. It's going to be a lot of fun. Looking forward to it."